If you're like me, then you might already be looking forward to the holidays and beginning to contemplate what to get each and every special person on your Christmas list. Or you might be looking for a great selection of educational toys for kids to help compliment your child's studies this school year. Either way, you'll want to listen up to learn more about the brand new VTech InnoTab 2. The InnoTab 2 Interactive Learning App Tablet brings all the magic and innovation of Mom and Dad's tablet into an educational experience, providing endless fun and wonder for your child. With so many apps, games and activities to explore, this learning app tablet will engage your child for hours as they play and discover. I recently had the chance to review the VTech InnoTab 2 with Riley, which offers a host of innovative features, making it one of the best educational toys for kids that I've seen. Keep reading to learn more! I reviewed the InnoTab 2 Interactive Learning App Tablet from VTech, which retails for $79.99, but is currently on sale for $79.00 with FREE SHIPPING. Adapting the design of Mom and Dad's favorite touchpad devices, the VTech InnoTab 2 Interactive Learning App Tablet helps your child take learning to the next level with one of today's most popular technologies. This multimedia tablet combines interactive reading, learning games, creative activities, and tools in a sleek and durable educational toy. Thanks to its 5-inch color touch screen and tilt sensor, kids ages three to nine years old can touch, flick, and drag their way to learning fun. Kids will be captivated by the InnoTab 2's vivid and interactive e-books, which offer narration, character voices, graphics, sounds, and music, in much the same way as the V.Reader or MobiGo stories do. Children can learn reading comprehension, vocabulary, and phonics while interacting with animated characters. Words are highlighted as kids read, and offer proper pronunciation and definitions when touched on the screen. Each e-book comes with a story dictionary. The definitions make it easy for children to understand the word and the context of the story. When you register your new InnoTab 2 through the included Learning Lodge software, you'll also receive 2 FREE downloads (excluding premium content). Since my readers have expressed to me in the past that obtaining these free downloads can be a little tricky, I've created a step-by-step video tutorial to guide you in claiming them. 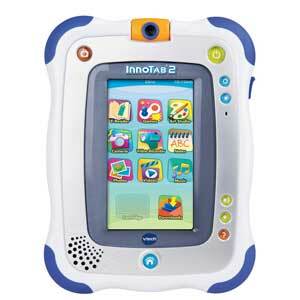 The InnoTab 2 offers a variety of games and activities that keep your child happy, learning, and occupied for hours. What's more, the InnoTab 2 is a rocking new edition to its predecessor thanks to the rotating camera, video recorder and microphone. These features put your child and their friends directly in the middle of the action by allowing them to take pictures and video and then edit and save their photos with wacky special effects. 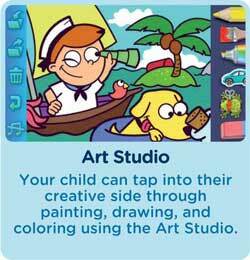 Its multimedia players let children listen to music and view video, while the art-studio app allows them to draw with their fingers or the included two styluses. Kids can even color in the InnoTab 2's virtual coloring book and bring these pictures to life by tilting the tablet from side to side. There are plenty of amazing motion games too which are played by tilting, twisting and turning the InnoTab 2. Since my daughter is only 3 years old and doesn't quite possess the fine motor skills needed for traditional video games, I'm thrilled that she's still allowed to have a blast by using the motion sensor of this tablet. You can also use the included and attached kickstand to prop up the InnoTab 2 on its side and display the 5" Color Touch Screen on any table. Another handy feature is how the screen will automatically orient itself to the correct position when the InnoTab 2 is turned. Just like an adult's touchpad device, the InnoTab 2 syncs to any Mac or PC with the included USB cable. Once you connect it to the web, you can easily download games, e-books, apps, and other fun activities from VTech Learning Lodge. Parents can also use the Learning Lodge to stay abreast of their kid's progress on a variety of educational lessons and milestones. 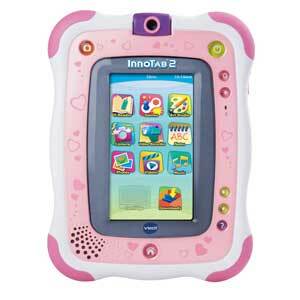 My daughter absolutely loved her new InnoTab 2 from VTech. She really enjoyed taking pictures with the new rotating digital camera and I enjoyed seeing the world through her eyes for a moment. 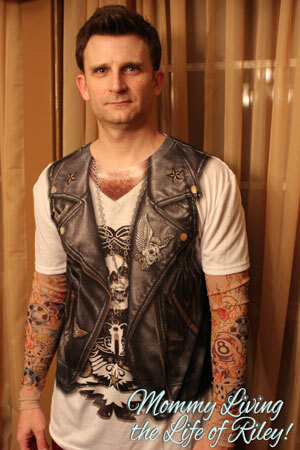 We even laughed ourselves silly once when we edited our pics with the included special effects. Of course, she also likes the Art Studio and uses the coloring app almost daily. I really appreciate how easy it is to introduce Riley to the world of technology with a device that can grow and change right along with her. She's only 3 years old now, but there's no doubt in my mind that she will be enjoying her InnoTab 2 for many, many years to come. If you have a child between the ages of 3 and 9 years old to shop for this holiday season, then by all means, give them the gift of educational entertainment with the VTech InnoTab 2 Interactive Learning App Tablet! Disclosure: I participated in a campaign on behalf of Mom Central Consulting for VTech. I received product samples to facilitate my review.